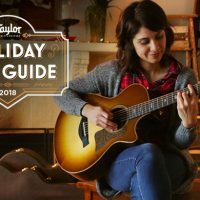 If you’re pondering the purchase of an acoustic guitar, you’re probably looking for ways to narrow your search among the sea of options out there. Chances are you already know to start with reputable, quality brands. What next? 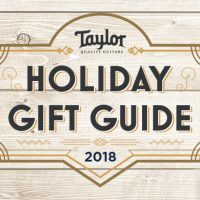 Given the wide range of price points, even within the product line of the same brand, it helps to get a handle on the fundamental differences in material construction and how those differences can impact a guitar’s sound and performance, and as a result, price. Like a good meal, with a quality guitar, good ingredients matter. Let’s focus on the materials used to construct the guitar body. At its essence, the body is a shapely sound box that functions as a natural amplifier for the strings. 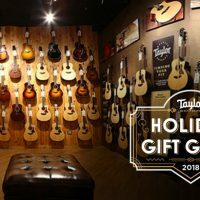 You strum a chord, the taut strings vibrate and channel that energy into the contoured box created by the assembled top, back and sides, and push that air out through the soundhole as, well, sound. While different types of materials can be used for the body, the most common is wood. In fact, the particular species of wood used for the top, back and sides of a guitar will play a significant role in “flavoring” its sound. We’ll save our tonewood comparison for another post. Let’s take a closer look at wood and other material components. 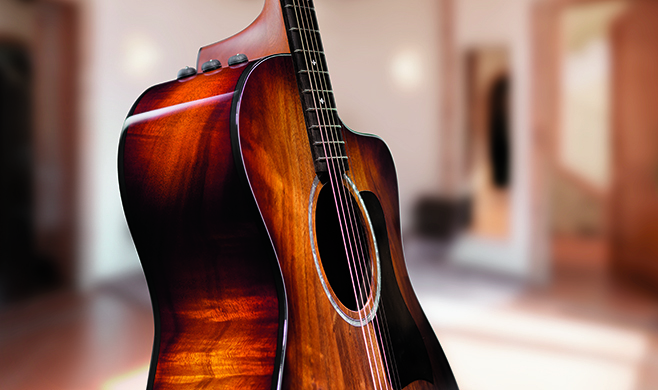 One of the widely recognized distinguishing features of a premium or professional-grade acoustic guitar is the use of solid wood panels for the top, back and sides. Solid wood construction tends to express a wood’s tonal personality in the fullest, most complex way, resulting in a superior musical sound. The particular species of wood, and the properties associated with it, will also impart the most sonic color or flavor to the sound when made with solid wood. Another appealing payoff with solid wood is that the guitar’s sound will improve with age and extended playing as the cell structure of the wood naturally changes over time, making the guitar even more resonant and responsive. (Think of a fine wine’s flavor profile improving with age or the way a baseball glove or a pair of jeans gets worn in with use.) 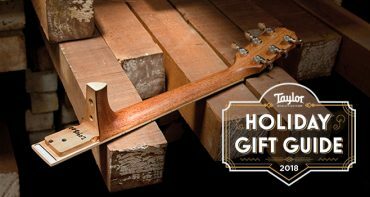 This is one of the rewards of owning a well-crafted solid wood guitar and why, if well cared for, it makes an heirloom-quality instrument. 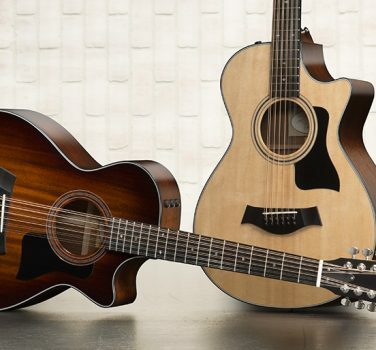 Because of the premium tonal response of solid wood and the cost associated with sourcing, conditioning and carefully processing the exotic tropical tonewoods favored for guitars, solid wood acoustic guitars tend to be the most expensive. But they typically deliver the highest level of musical fidelity. 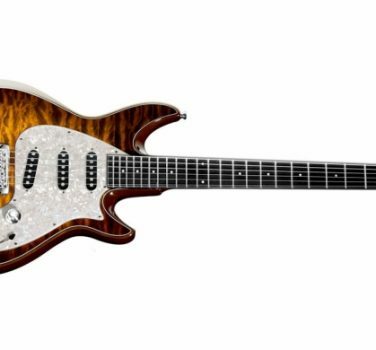 In an effort to offer customers other more affordable options, many builders also make guitars featuring laminate back and sides. 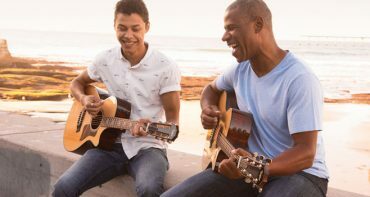 Using solid wood for the top is still preferred by most builders because the top plays a major role in translating the initial energy of vibrating guitar strings into rich acoustic sound. That’s why the top is referred to as the soundboard. Laminate refers to a multi-layered construction. You probably know the term from the flooring or cabinet industries. In the guitar world, laminate construction refers to thin layers of wood or other material that are bonded together, sometimes featuring an outer layer of exotic, visually appealing veneer. (Picture the rich-looking burled wood trim found on a luxury car’s dashboard.) Laminate construction enables builders to reduce their material cost, streamline the production process, and conserve wood resources. For example, in cutting solid wood panels for acoustic guitars, the yield is about four pieces per inch of thickness (the typical thickness of a back/side panel is about 3/16 of an inch). The cutting process also produces a certain amount of material loss from the sawdust generated. By contrast, the thin sheets of wood used for outer veneer of laminate back and sides are cut differently — they’re sliced or peeled with a fixed blade, almost like a deli slicer cuts thin pieces of lunch meat, or like peeling an apple. The yield is usually between 30 and 40 slices per inch, without generating any loss of material in the form of sawdust. The laminate construction process can also yield greater structural resilience, since the layers are typically arranged using alternating grain directions. 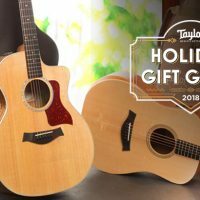 This durability can help the guitar remain structurally stable in the face of fluctuating humidity conditions — which is nice if you plan to travel with the guitar — and leave that part of the guitar less vulnerable to the possibility of cracking in dry conditions (which is an important consideration for acoustic guitars). 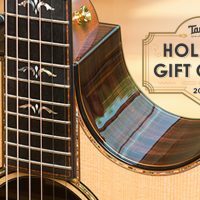 At Taylor, the wood lamination process also allows us to bend an arch into the back of the guitar for added strength, which eliminates the need for internal bracing to support the back. Where things can get murkier is the nature of laminate construction. While some laminate construction, such as our approach at Taylor, features a three-ply all-wood laminate — a core wood panel (poplar wood) with a layer of wood on either side — in recent years, modern laminating techniques from other industries, such as the countertop manufacturing industry where Formica originated, have also been deployed in the construction of acoustic guitars. Once that approach caught on, manufacturers started making flooring out of MDF (medium density fiberboard), which is compressed sawdust — think of most IKEA furniture — held together with heat and resin. In one sense, this approach might seem eco-friendly because it makes good use of the material, but in reality it isn’t because of the glues, the resin process, and the chemicals used. Using plantation-grown and -managed wood is actually far more environmentally friendly. 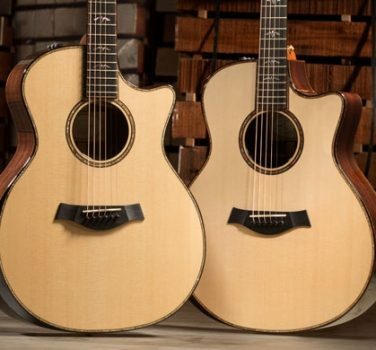 To avoid confusion with the array of laminate products in the marketplace that are made with synthetic, non-wood materials, at Taylor we use the term “layered wood” to identify Taylor guitars built with laminated backs and sides. 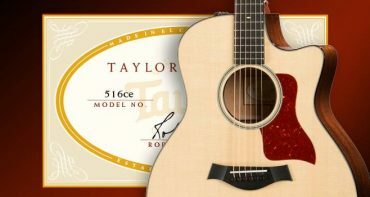 (All Taylor models feature solid wood tops.) In home construction products, all-wood laminates are seen as a more premium product compared to other laminates, as they should be in guitar building, as more wood equals better tone. 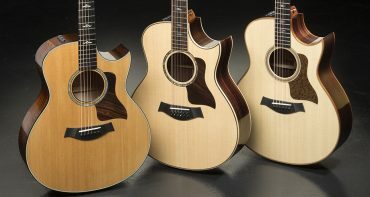 Within Taylor’s product line, our all-solid-wood guitar bodies range from the 300 Series and up. 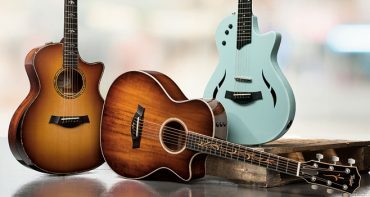 Guitars featuring layered wood back and sides with a solid wood top include the 100 Series through the 200 Deluxe Series, along with the Baby Taylor, GS Mini, and Academy Series.